THP has all of your information about this new and innovative line of irons. At the bottom of this article, you will find a link to click through to the THP Forums for many more in hand pictures and initial thoughts of clubs from our early testing. The 3- through 7-irons boast the most sophisticated clubface TaylorMade has ever created for a Tour iron, fashioned from fast, high-strength stainless steel with improved Inverted Cone design. Consistent distance gaps throughout the set made possible by careful management of the RBZ Speed Pocket, Inverted Cone, face thickness, CG location, loft and shaft length. RocketBladez irons are priced at $799 with steel shafts, $899 with graphite shafts, and are available for pre-order on October 23. The irons hit retail starting Monday, December 3. 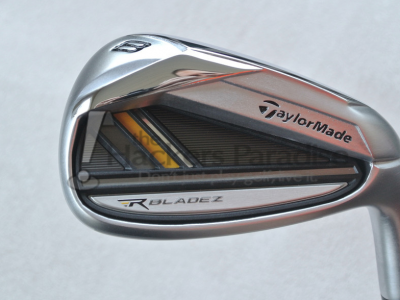 RocketBladez Tour Irons will be available at retail February 1 for $899. The RBZ Speed Pocket flexes and reflexes at impact to add speed to the clubface, which increases ball speed and launch angle. The Speed Pocket is filled with a specially formulated polyurethane developed by 3M that quiets vibration without significantly slowing/inhibiting the flex of the pocket, while also keeping debris out. In conjunction with the highly sophisticated face design (11% thinner than our previous thinnest), adds up to 10 COR points to the face compared to Burner® 2.0 irons, and promotes dramatically less drop-off in ball speed on impacts low on the face—where the majority of iron mis-hits occur. That means the COR low on the face is higher than it’s ever been in a TaylorMade iron, and the benefit is that thin shots carry significantly farther. THP has more in hand pictures and early reviews from testing in the THP forum. Click here to check those out. Quite interesting, not exactly what I picture when I think of blades especially given the cavity and the apparent thicker topline. Will be interested to read the on course feedback. Great read! I dont like how they claim that irons havent changed much, when they said the same for RBZ and 2.0. Were those major advancements at the time they were claimed, and now aren’t? Marketing ploy? Far from blades too. But I guess we’ll see what the tour model looks like. Great beginning information, I would love to see what the tour model will look like. I like the look and the design that allows easy lie adjustments is one heck of a luxury! Great job TaylorMade on yet another super product. 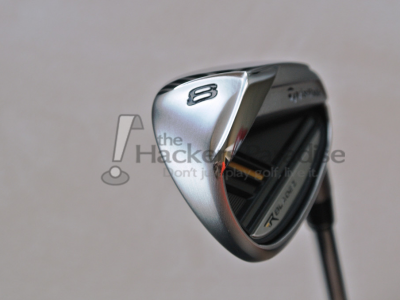 Interested why they had no comparisons to the RBZ irons. I personally think they were a big miss compared to the 2.0s and am glade to see they are getting back on track with the RBlaedz. However I really wish they woulda got rid of the terrible naming. Interesting. Can’t wait for the reviews. Very interesting. I’d like to give them a swing. Maybe I’ll pick up 17 yards. Certainly an interesting looking iron with some pretty bold claims. I’m looking forward to challenging them. I love the design and think there is definitely a huge market for irons like these out there. I’d love to see the Tour version as well. Thanks for the info! A great read! Looking forward to maybe getting these in hand and trying them out! How could you not want more ball speed and more carry on mid hits? Interesting. Kinda looks like a mash between AP2, Diablo and i20…with a slot in the bottom…but oddly enough it works. Honestly the looks are more understated than I would have expected from TMag, but I think they’re nice. Should be interesting in play. Definitely an interesting concept. I really wish they would get away from this type of name though. Very cool, this may be the first distance iron that really catches my attention and I love that they incorporated a way to bent the lie angle. These look cool ! Very interesting to say the least. I like the new badge and the look of them. When seeing the pics they dont say Blade to me but I guess if they do what they say they do, I dont care how they look. Looking forward to the full review. I like the looks, a lot. Hopefully some good shaft pairing. I really like the looks. I think they cleaned the cavity up very nicely. A nice clean look in the top down photo that can be seen in the forum thread. I’d like to swing one just to see how it feels. Very attractive iron. I love my Rocketballz irons, but will check these out closely when they hit the shelves. Really interested in both the regular and tour versions. Been itching for a set of irons that appeals to me. Haven’t hit anything I like more than my current r7 TPs. Love the styling on these. Very interesting. I will be intrigued to try these out once they are available. It will be hard to get my R11’s out of my hands though. TM has put out some nice products lately and this is certainly another one that will spark some interest. One thing I enjoy about their offerings is that they can push the envelope when it comes to design and aesthetics, and for the most part, it’s well received. I also am digging the slight color accent in that gold. Very nice looking iron and looking forward to more of THP’s findings on them. I’m really interested in the Tour version. I can’t wait to hit these. I remember many years ago when the powers that be were all worried about the “trampoline effect” and now this technology is all over the place. Hitting these would be a pleasure. great article. They hype it up as a major innovation, but will the results stand up to the hype? I’m definitely interested in the tour version. Interesting looking package of looks and claimed performance. I would be interested if they are as good as advertised. I’m glad they didn’t make the 4 and 5 irons bulky like the RBZ irons. Hope these go over well for TM and the golfing public! Good read and I think a step in the right block niche. A lot less mass than the original, but still have the new standard I guess to help with distance. As long as it’s the springboard is not “across” the board and they say it isn’t, good show The entry line is meh, but the tour would be worth a visit. I like the design of the badge on these babies. The top line would take some getting use to. I’m kind of thinking of waiting along with Playdough to see how the Tour model looks in February of next year. Overall for me my main concern will be distance control. I guess we’ll find out after the reviews hit the THP homepage. They look better than I anticipated from the “zebra” pics. I’m definitely interested in hearing more about the Tour version and seeing more pics. 2 things pleased me about this line so far. 1. the fact that they filled the speed pocket with something so that it doesn’t become filled with debris. 2. A lower CoG than the 2.0 is huge. Those irons were some of the easiest to elevate that I’ve ever used, improving that may be a goldmine for a lot of amateurs. SW hit the nail on the head. I was looking to get a used set of 2.0 or RBZ … this give me pause. Taylormade never stands still. This is just another quality introduction that seems to be continually pushing the technology boundaries. ” Increased ball speed and distance below the center of the face” ??? doesn’t that just mean thinned shot wont just fly the green anymore , they will now fly the green, the next two fairways and hit a car in the parking lot? I can’t wait to read the review of these babies. I like the yellow – very stealth looking! I can’t wait to see how the slot works on the irons, I’ve gotten great results on the woods, have a feeling it will change the distances on my irons big time! It will help to cure a messy kitchen. You just can’t seem to find the right product for your kitchen and install new kitchen whiteboard organizer cabinets. Some of the different canisters are square, bamboo, country apple, stainless steel and acrylic. Start with shelves Don’t forget to label! parts separated and to know which ones should be placed below the waist level.